Sleek and stylish, the euro design forearm crutches by Vive offer stabilizing support and greater mobility when recovering from an injury or surgery or managing a long term disability. Ergonomically designed arm cuffs and hand grips provide a comfortable experience throughout the day. Lightweight and durable, the corrosion-resistant aluminum frames are also height adjustable for a customized fit. Providing a comfortable and secure experience, the forearm crutches eliminate the fatigue and pain caused by standard crutches while allowing you independent mobility when experiencing a long term disability or recovering from an injury or surgery. The supportive, ergonomic grips are contoured to fit your hands, reducing hand and wrist fatigue and ensuring proper positioning for maximum safety and support throughout any activity. The forearm crutches have a stylish steel gray matte finish with black arm cuffs and hand grips. Easy push button adjustments allow the height to be adjusted in 1" increments and securely lock in place for a customized fit. 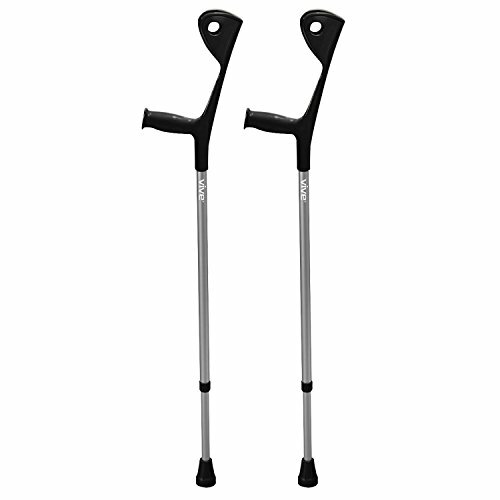 Each crutch is capped with a non-skid, non-marring rubber tip for added safety and security. The arm cuff and hand grip are molded as one piece for greater stability and durability. The lightweight aluminum frame allows you to move easily throughout your day. Corrosion-resistant, the durable aluminum frame supports up to 300 pounds. DON'T LET YOUR INJURY HOLD YOU BACK: Providing a comfortable and secure experience, the forearm crutches eliminate the fatigue and pain caused by standard crutches while allowing you the mobility needed when managing a disability or recovering from an injury or surgery. The supportive, ergonomic grip is contoured to fit the hand, reducing hand and wrist fatigue and ensuring proper positioning for safe mobility throughout any activity. STYLISH NEW FINISH: The forearm crutches have a stylish steel gray matte finish with black arm cuffs and hand grips. ONE DURABLE AND LIGHTWEIGHT PAIR: Arm cuff and hand grip are molded as one piece for greater stability and durability.The lightweight aluminum frame allows you to move easily. Corrosion-resistant, the durable frame supports up to 300 pounds.